Observator Instruments recently rented a OMC-7006 Data Buoy to Martens & Van Oord. Besides the supply of custom made data buoys, Observator also offers the possibility to rent these data buoys for short term projects. For this particular project, Martens & Van Oord required a continuous and reliable monitoring of turbidity with a possibility to generate an alarm when the values exceed certain levels. Martens & Van Oord was awarded with an order to carry out dredging works at the Hollandsch Diep river. Because of the fact that the dredging works took place in close proximity of the water inlet of a petrochemical refinery the permanent monitoring of turbidity values was crucial. 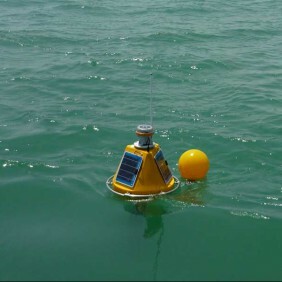 Observator supplied the OMC-7006 Data Buoy assembled with the NEP5000 Turbidity Sensor and OMC-045-III GPRS Data Logger. The acquired data was transmitted frequently to the Observator OMC-Data-Online data server meaning the data was accessible 24/7. Besides this, alarm thresholds were programmed, so project engineers were alerted directly when turbidity levels raised to alarming levels.